Few cities has as many epithet as New York, not least when it comes to the food scene. 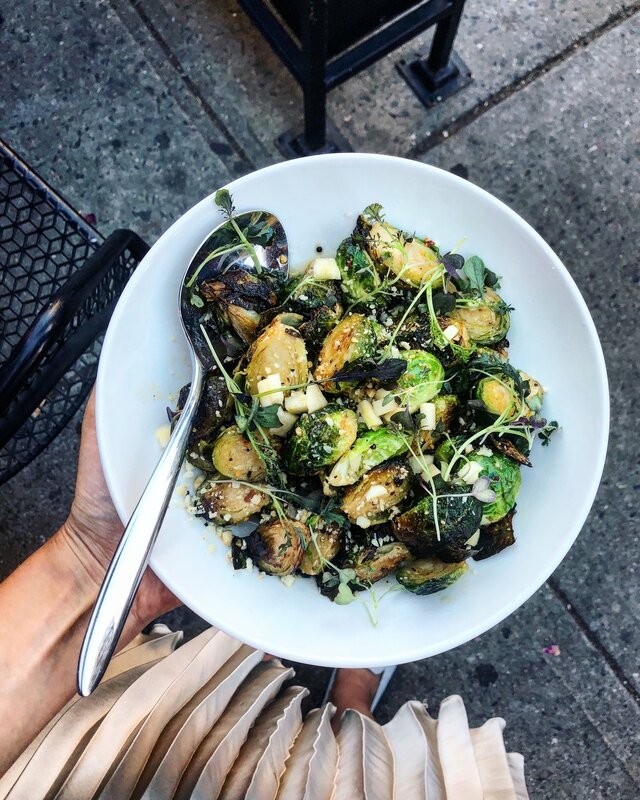 The city offers everything from Micheline-starred restaurants to simple breakfast places and from popular (nutritious) fast food restaurant chains to trendy brunch places which to the greatest extent - or fully - are focusing on plant based food. Not only is PLANT BASED a huge thing - organic, sustainable, refined sugar free and gluten free are also very common or available upon request. The city that never sleeps has turned in to the city that always offers something plant based! 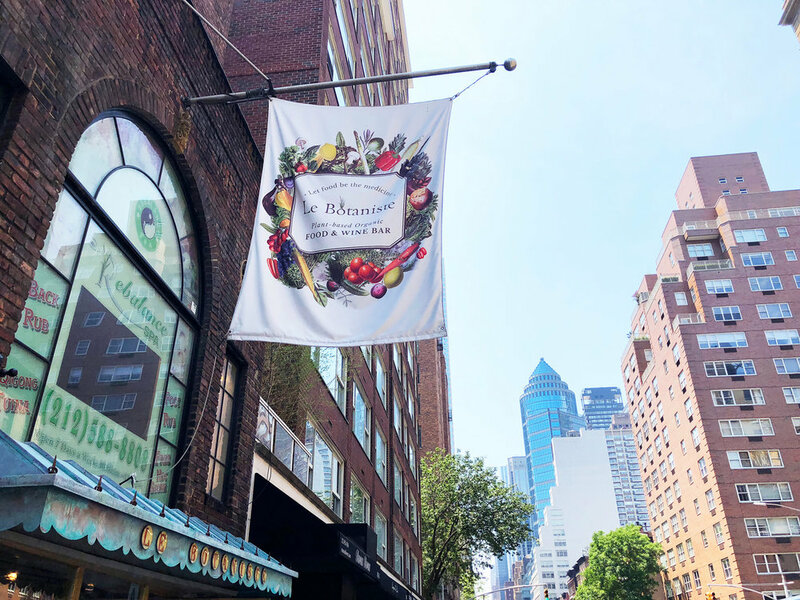 This summer I spent almost two weeks in the city, and was doing my very best to scan the city and explore as much of the plant based food scene as possible! Breakfast in West village, lunch in Brooklyn, dinner in Noho. Day out and day in - with lovely morning runs in the park, lots of strolling up and down the streets on Manhattan, park hang outs and family dating in between. In a city where things are constantly changing there is always something new to discover; mini tacos with blue corn tortillas and pulled jack fruit, gluten free pizzas with incredibly crispy bread and creative all plant based spreads and toppings. Beautiful salad bowls filled with colors, flavours and textures. Bean protein burgers wrapped in collard greens and locally grown veggies cooked á la fine dining. Fluffy waffles, lovely produce from the markets and all sorts of hot and cold drinks for every occasion. Let the food guide you through the city! At two locations on Manhattan you’ll find this tiny Australian place opened from early breakfast to late afternoon. The menu offers delicious things such as chia puddings with granola and berry toppings, magically fluffy sweet corn patties with smashed avocado, salads and a bunch of delicious drinks - both hot and cold! This place is especially famous for their Australian style Smashed avocado on rye bread. West village: 581 Hudston St, New York. 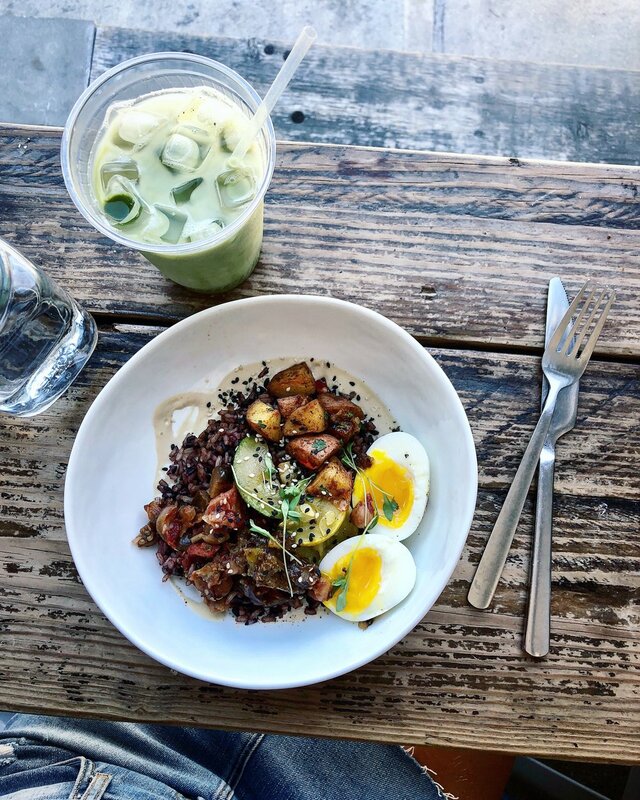 Nolita: 19 Kenmare St. Williamsburg: 271 Metropolitan Ave.
A very popular breakfast, brunch, lunch AND dinner place! The interior makes your mind travel to more southern latitudes and invites to hours of sitting down, enjoying great food and drinks and hanging out by the small coffee tables. Start with a freshly pressed juice or a matcha latte followed by a pretty smoothie bowl or a fluffy waffle with berries for breakfast. Have green tacos and kale salad for brunch or how about pizza, pasta or burgers for dinner? All plant based! No matter what time of the day you visit The Butchers daughter - there is always something sweet close to hand to round off your meal. You find The butchers daughter at two places on Manhattan. A long marble counter with all sorts of gorgeous veggies, dips, curries and other plant based components greets you when you step in to Le Botaniste. The menu offers everything from hearty salads and curries to sushi wraps - and also sweet stuff for days when that’s what you’re after. Le Botaniste is located on two spots on Manhattan (and at a few places in Belgium, where the founder was born). A little gem in Brooklyn with a relaxed setting that invites to both a hot drink + something sweet (what we in Swedish would call “FIKA”) but also lunch or weekend brunch. The savoury menu is quite small but the dishes are tasty. The baked range and drinks range is a bit bigger. The signature dish; The monk bowl with seasonal veggies was a perfect, yet quite small, lunch. And the iced matcha latte on oat mylk was a perfect cooler during a hot day. For cold days you could order it hot instead! My tiny skepticism when it comes to restaurant chains (as I sometimes find the authenticity being lost in the whole concept/chain thing) disappeared when I had my first burger at this popular burger joint. This is a place where the menu is creative yet simple - just like we want our burger menus. Here you’ll find everything from the classic ones to the more rethinking, like “The impossible burger” made of soy protein served with vegan cheese and all the essential toppings. And “The beyond burger” made of bean protein, served with green pea hummus and herb oil, then wrapped in collard greens. Have it with your choice of fries for the complete burger experience! On the southern part of Manhattan, between NOHO and East Village, star chef Matthew Kenney has opened three all plant based restaurants with three different themes on a not-to-little-not-to-much-of-a-busy-street. The menus are creative, fun and - all of the things I’ve tried - delicious. Bar verde is a Mexican inspired restaurant and on the menu you’ll find most of what the Mexican kitchen has to offer - with a plant based twist; tacos, nachos, quesadillas, fajitas, mole, grilled corn and roasted sweet potato. I came here for dinner 2 times in 3 days - a must since there was to much to try from the menu! Another popular plant based restaurant in the NOHO/East Village area is this all plant based pizza place. The pizzas are no doubt among the best ones I’ve ever had. The gluten free bread (which can be ordered upon request) is super crispy and all the different toppings are creative yet unpretentious - and of course delicious! Choose between pizzas with a tomato base and white ones - topped with carefully chosen veggies. Also, a wise thing would be to order the “Nut cheese platter” as a starter or side + one of the green sides such as grilled brussel sprouts with apple and macadamia cheese. We ordered a few pizzas to share, a great way to try them all! At ABCV you find plant based, sustainable and mostly organic food made out of produce that comes from smaller farms. The kitchen serves creative dishes with a touch of fine dining during lunch and dinner. Sit in or have it to go. Two favourites from the menu would be the incredible sweet and silky whole grilled cauliflower with turmeric tahini dressing and pistachios. And beluga lentils with a sourish vinaigrette, herbs and roasted sweet potato. Hu kitchen is a food store and restaurant with the slogan “back to human”. Their mission is to create a place where you can be comfortable with every ingredient in all the foods available there. At Hu Kitchen they have a market place with small-batch artisanal foods + their own specialty packed goods, a liquid bar offering all sorts of good-for-you-liquids you can think of, a “Mashbar” where you can get customised snacks such as chia puddings and creams. They also have baked goods and of course “the hot line”, “bowl station” and “prepared foods by the pound” where you can get food where you can be comfortable with every ingredient. Come here to get a snack or buy something to bring to the nearby Union square park during summer season. A very popular weekend hangout - and in fact the biggest outdoor food market in the whole US - where about 100 venders sell their food during weekends between April to October. Here you can find pretty much anything you’re craving; anything from smoothies, tacos and asian pancakes to ice creams made of coconut milk. The market offers both plant based and non plant based foods. At Saturdays you find Smorgasburg in East River State Park - make sure to come here by taking the river ferry from the southern part of Manhattan to get a lovely view over the skyline on your way over the river. Whole foods is a grocery store known for their healthy and organic food. 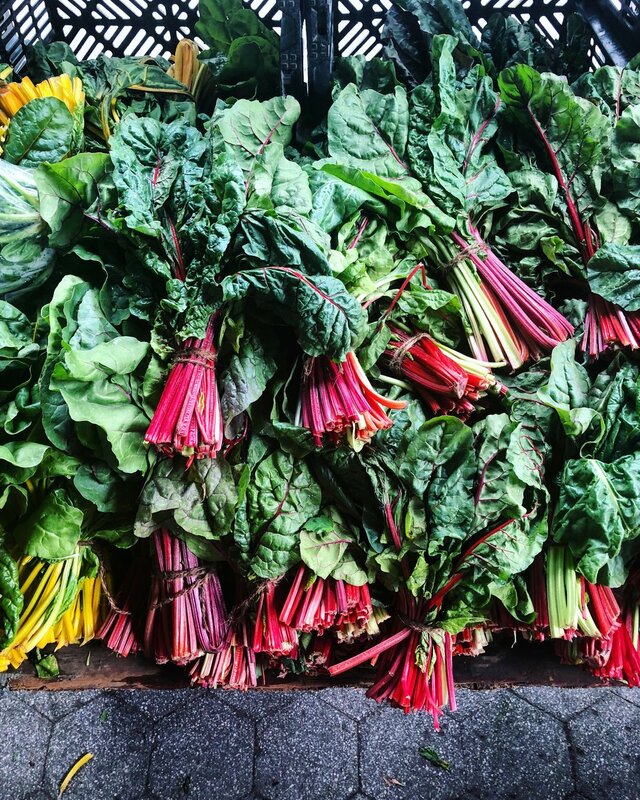 If you like me like to wander in grocery stores when visiting new places (or not to forget - places you’ve been to before) you’ll be sure to find lots and lots of fun produce and products to discover here. When you’ve spent an hour or so wandering around by the fresh fruits and veggies, all shelves with fun snacks and pantry goods and the grind-your-own-nut-butter section there is still some fun left. Don’t miss the salad bar where you’ll find both cold salad components but also hot food. My favourite thing is to mix a delicious salad with my favourite components and bring the food to any of the nearby parks, the river side or to the magnificent rooftop of my very good friend living in the city. Parts of this guide was originally published in was first published in The Gothenburg-Post/Två dagar.